It seems that on 13 April North Korea has deliberately aborted the launch of its Unha-3 rocket by letting the first stage of the booster to blow up just one minute after the lift-off. By so doing, the DPRK has avoided the situation where it would have been shot down by South Korean or Japanese anti-missile defense (despite serious doubts about their capability to do so). North Korea lives in a virtual reality. It is a revolutionary state where nothing changes. It is officially ruled by the deceased leaders. And its people continue to suffer from the shortages of food and energy but claim they do not envy anyone. The controlled detonation of the booster could be the face-saving exercise – a better option compared to the potential embarrassment which would have been caused by Japan or S.Korea’s anti-missile defense forces. Surely, something went wrong in the first seconds after the lift-off and the Central Control Room must have decided to abort the flight of Unha-3 after one minute of the flight. As the result, everyone will stay safe and happy: rocket scientists in Pyongyang have learnt more about their project, conservative politicians in Seoul and Tokyo are celebrating the victory, and the Obama administration does not look soft on North Korea any more. Even Moscow and Beijing may now feel reliefed that North Korea does not pose as much threat to the neighbors as it had been anticipated before the launch. And the people of North Korea, while being informed that Juche-style science and technology is the best, are even more consolidated around the Young General. (by William Choong, The Straits Times, 14-04-2012) North Korea, hosting nearly three dozen foreign journalists on a rare media visit this week, has sought to sell them two hoary chestnuts. Pyongyang has the right to launch a peaceful satellite, the journalists are told, and a successful launch will further its aim of becoming a “strong and prosperous” nation. Yesterday, however, the chestnuts were roasted rather than toasted. The Unha-3 rocket splashed into the Yellow Sea after a minute of powered flight. Ironically, an Associated Press journalist tweeted from Pyongyang that a traditional Korean folk song, Roasted Chestnuts, was being played on state television at the time of the launch. The launch, not unexpectedly, drew strong condemnation from many countries, which stressed that it was a cover for a ballistic missile test. For the first time, Pyongyang – to its credit – admitted that the launch failed. In 1998 and 2009, it insisted that satellites had been lofted into orbit when in fact they had not. Pyongyang’s insistence on pushing through with the launch has rallied the global community, which has been seeking to manage its missile and nuclear programmes for more than two decades. The five permanent members of the United Nations Security Council – Britain, China, France, Russia and the United States – have held informal talks, according to an Agence France-Presse report, and the council is expected to issue a statement to condemn the North’s latest act. The US, South Korea and Japan called the launch a “provocative act”. Even Russia, an old ally of North Korea, has said that the launch was in breach of UN resolutions which imposed sanctions after Pyongyang’s first two nuclear tests in 2006 and 2009. Yesterday’s launch – Pyongyang’s third test of a space rocket since 1998 – would accelerate joint efforts by the US, Japan and South Korea to build missile defences. This would blunt the North’s missile threat and impact China’s relatively small arsenal of nuclear weapons. China, a long-time ally of North Korea, said it was “very concerned” by the launch and that all efforts should be made to defuse tensions. But even Beijing would be hard-pressed to maintain its support for Pyongyang. More importantly, Pyongyang under new leader Kim Jong Un seems to be on a path that will leave it increasingly isolated. News reports said that the North might proceed with a third nuclear test to make up for yesterday’s humiliation. Mark Fitzpatrick, a non-proliferation expert at the London-based International Institute for Strategic Studies, said the failed flight would still provide North Korea with information necessary for missile development. “Unless the North Koreans are deterred or otherwise dissuaded, they probably will eventually meet their goal of developing a long-range missile,” he said. Taken together, however, a third nuclear test and the development of long-range missiles would only accentuate Pyongyang’s isolation. In the long term, the global community will have to play the same old waiting game. The Americans call this “strategic patience”, or waiting for North Korea to either implode or effect a change of heart. In his latest book, The Impossible State, Dr Victor Cha says that a growing contradiction in North Korea would only accelerate under its youthful new leader. A growing gulf between the state and the North Korean people will “cause a crisis of governance and uproot the foundations of the regime”, writes Dr Cha, who served as Asia director at the National Security Council under former US president George W. Bush. Ultimately, an easing of tensions on the Korean peninsula would come about only when the North, in the words of President Barack Obama, unclenches its fist. For now, this looks unlikely, given Kim’s need to stage a show of strength to bolster his currency at home. This is why South Korea will continue to be wary of further provocations by the North. China, too, will continue to worry whether any softening of Pyongyang’s hardline position would lead to a historic reunification of the two Koreas – and the deployment of US troops near the Korea-China border. Korea watcher Leonid Petrov, from the University of Sydney, says the global community might have to wait for new administrations to be installed in South Korea and the US before any new policies are put in place. Both countries are holding presidential polls at the end of the year. (John Larkin, “Asia 360: News in Context” 30 March 2012) To the outside world, North Korea’s latest diplomatic provocation is a puzzling reversal, to say the least. As a by-product of Pyongyang’s ruthless pursuit of regime survival however, it just might make perfect sense. Less than three weeks after signing a deal with the United States to suspend nuclear and missile programmes, Pyongyang put the pact at risk by announcing a plan to launch a satellite that most observers believe amounts to a missile in the making. Under the February 29 deal, Pyongyang agreed to suspend uranium enrichment and long-range missile tests, as well as allow inspections of nuclear facilities, in exchange for 240,000 tonnes of food aid over the next year. Assuming the launch goes ahead, that deal appears to be a dead letter. Why would Pyongyang agree to freeze its weapons programmes in return for a mountain of food aid, only to deliberately wreck the pact within days? “It doesn’t sound logical or consistent,” says Leonid Petrov, a Korea specialist at Sydney University. “But North Korea has its own logic.” Driving Pyongyang’s logic is the paramount importance of regime survival. Faced with the choice of feeding its hungry people or flexing a new military muscle to bolster domestic support, Pyongyang will opt for the latter every time, say North Korea watchers. The launch of the Kwangmyongsong 3 satellite is scheduled to happen between April 12 and April 16 — during mass festivities to commemorate the centenary of North Korea’s revered founder Kim Il-sung. Pyongyang claims the satellite is a peaceful initiative justified under the Outer Space Treaty, which codifies the use of space under international law. The rest of the world, even its ally China, believes the ballistic technology can also be used for missile development and therefore violates two UN Security Council resolutions. All of North Korea’s major neighbours, and the UN, have denounced the launch plan. But Pyongyang has some good reasons to ignore the outrage. North Korea’s leadership has promised that 2012 will be the year the nation emerges as kangsongdaeguk: strong and mighty. Kim Jong-un is under pressure to deliver appropriate fireworks on April 15. He plans to spend US$2 billion, a third of North Korea’s total annual budget, on the centennial celebrations, according to an estimate published by South Korea’s Chosun Ilbo newspaper. Pyongyang looks willing to sacrifice a closer relationship with the US, supposedly one of its top foreign policy goals, at the altar of regime security. “US relations can wait five, or even 10 years,” says Petrov. The question is whether Pyongyang’s volte-face was premeditated. If it was, says Petrov, the calculus may have been to hope that the US takes the line that humanitarian assistance is apolitical, and delivers the food aid anyway. Even if Washington retracts the food aid, Pyongyang can revert to its time-honoured tactic of accusing the US of pursuing a hostile policy, then blame it for the inevitable escalation in security tensions. Adding credence to this view is the nature of the food aid. The brains at Pyongyang probably calculate that it would not lose much as the aid comprises mostly high-nutrition biscuits destined for women and children rather than the Korean People Army — a crucial support pillar for the regime. One intriguing theory is that the sudden back-pedalling from the conciliatory food aid agreement reflects fractures within Pyongyang’s ruling echelon, with hardliners vetoing reformists who framed the February 29 deal. “The situation then appears to be two different groups of elites, with two different intentions,” Andray Abrahamian, a North Korea specialist at Ulsan University in South Korea, wrote recently in the Pyongyang-watching blog 38 North. But with Pyongyang’s machinations and motives as opaque as ever, the real question is how the US and, possibly, the UN Security Council will react to this latest affront. Pyongyang’s decision to launch from the west coast rather than the eastern pad used in two previous failed launches, means the rocket is not likely to fly over Japan. This might be enough to prevent a UN Security Council sanction. “I don’t think that they will face any significant penalties,” said Marcus Noland, deputy director of the Peterson Institute for International Economics in Washington. “While the Chinese are reportedly displeased, it’s hard to imagine them implementing tougher sanctions.” Perhaps the clearest takeaway from this morass of conflicting agendas is the difficulty of negotiating with a nation that refuses to abide by the traditional norms of diplomacy. Yet again, the US finds itself snookered by Pyongyang. If it delivers the food aid as promised, it will stand accused of caving in to ballistic blackmail. Yet if it withdraws the aid, Pyongyang will happily pocket another win, using Washington’s “hostile” policy to justify its continued possession of missile and nuclear weaponry. As world leaders gathered in Seoul for a summit on nuclear security this week, North Korea insisted that it would go ahead with the launch, calling it “a legitimate right of a sovereign state”. European Union leaders expressed “grave concern” at North Korea’s missile and nuclear weapons programmes, and urged Pyongyang to scrap the launch. Japan also used the summit to call on Pyongyang to show restraint. Washington’s next step will be crucial to determining how the imbroglio will play out. Most analysts expect it to retract food aid, which could hand the initiative to Pyongyang. North Korea’s 100th – To Celebrate or To Surrender? 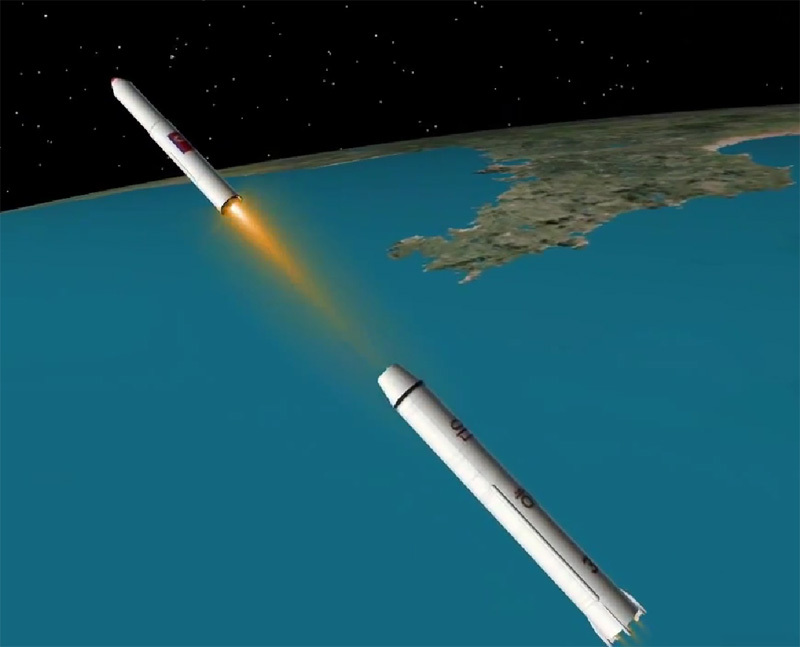 On 16 March 2012, North Korea announced that it would launch an earth observation satellite named Kwangmyongsong (Lodestar) 3, aboard an Unha carrier rocket sometime between the hours of 7 am and noon on a day between 12 and 16 April, to commemorate the 100th anniversary of the birth of its state founder, Kim Il Sung, and the attainment of “strong and prosperous” status by the country. 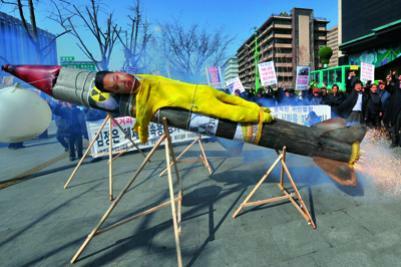 The launch from a base in the north of the country close to the border with China would be pointed south, dropping off its first phase rocket into the Yellow Sea about 160 kms to the southwest of South Korea’s Byeonsan peninsula and the second into the ocean about 140 kilometres east of Luzon in the Philippines. Due notice of the impending launch was issued to the appropriate international maritime, aviation and telecommunication bodies (IMO, ICAO and ITU) and, to mark the occasion, North Korea announced that it would welcome scientific observers and journalists. The 15 April date, in the 100th year according to the calendar of North Korea, has long been declared a landmark in the history of the state, and the launch seems designed to be its climactic event. Where polar orbiting satellites circle the globe 14.1 times each day on a north-south polar axis commonly at a height of around 800 kilometers, geostationary ones obit it roughly every half-hour at a height of around 33,880 kilometres (thus requiring advanced rocketry capacity), and because of their height they remain stationary with respect to the orbiting earth. Both types are multi-functional and in the words of the US National Oceanic and Atmospheric Administration (NOAA) they are able to “collect global data on a daily basis for a variety of land, ocean, and atmospheric applications … including weather analysis and forecasting, climate research and prediction, global sea-surface temperature measurements, atmospheric analysis of temperature and humidity, ocean dynamics research, volcanic eruption monitoring, forest fire detection, global vegetation analysis, search and rescue…” Many satellites, military and civil, are launched every year. The US has three of the stationary variety in operation. Russia, Japan, Europe, China and India also operate geostationary satellites, joined in July 2010 by South Korea. Japan conducts fairly regular launches from its Tanegashima space station site, and devotes some of its information gathering capacity to spying on North Korea. … As at time of writing (30 March 2012) there are several possibilities. Pyongyang might, although it seems unlikely, choose to buckle under the pressure and cancel the launch. Such display of weakness and repudiation of the legacy of the late leader would have unpredictable domestic consequences, and the act of submission would likely encourage the member states of the Beijing group to demand more. If, however, Pyongyang resists all pressures and proceeds with the launch, either the launch succeeds or it does not. If an “advanced geostationary meteorological satellite” duly takes its place in the skies, the world will face a fait accompli. Despite sanctions and irrespective of its poverty and isolation, North Korea’s claim to a place in the ranks of advanced scientific and industrial powers would be reinforced and, sooner or later, the hostile powers would have to return to the agenda of September 2005: a comprehensive peninsular peace and normalization agenda. If on the other hand the launch is unsuccessful and/or the vehicle breaks up or enters a missile trajectory, North Korea would face considerable loss of face both domestically and heightened hostility internationally, making early resumption of the Six Party talks unlikely. Embattled, it might resume nuclear testing (as it did when the Security Council denounced the failed launch in 2009), the regime’s hold would likely weaken and the “North Korea problem” might become just so much more difficult to resolve. Gavan McCormack is an emeritus professor of the Australian National University and a coordinator of The Asia-Pacific Journal. He is author of many books and articles on modern and contemporary East Asia, and many of his articles are accessible on this site. His Target North Korea: Pushing North Korea to the brink of Nuclear Catastrophe, was published in 2004 and translated and published in Japanese and Korean. In 2008 and 2009 he contributed a monthly column to the Seoul daily Kyunghyang shinmoon. His discussion with John Dower of the prospects for 2012 was featured on NHK satellite television as its New Year program (“Kantogen 2012”). His most recent book, co-authored with Satoko Oka Norimatsu, is Islands of Resistance: Okinawa Confronts Japan and the United States, forthcoming, Rowman and Littlefield, July 2012.